Kiwanis of Lafayette congratulates Victoria Maria’ Hernandez, the 2016 Kiwanis Football Jamboree Queen. Tory is the daughter of Valarie Hernandez. She was born in Lafayette and was diagnosed with Congenital Muscular Dystrophy at 10 months old. Tory attended elementary school in Lafayette Parish and is currently a Senior at Acadiana High School where her favorite teacher is Kay Hobbs. 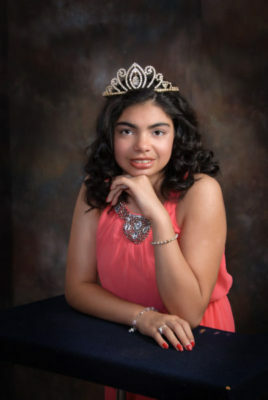 Her school activities have included swimming, baseball, soccer, cheerleading and 4-H Club. Victoria is a big fan of Cajun Country music, an avid follower of Facebook and a binge watcher of Dancing with the Stars. After graduation, Tory plans to enter the work force so she can pick up the tab when she and her mother have their weekly dinner date. Kiwanis of Lafayette thanks Goodwill Industries of Acadiana for their sponsorship of the Kiwanis Jamboree Queen!